Guys this PPDT image is sent to me by one of my Friend Shailedra Rajput, he was following me since one month and was preparing for his SSB Interivew . He writes really well and i appreciate his work. I have uploaded a series of PPDT sample Images with Story for Practice you can refer to my previous stories for better Practice. This image consist of scene where some students are playing in playground with similar uniform. Rana is a captain of football team representing mechanical in his college, due to failure in the last match played Rana along with his team mates practices daily during evening hours 2 hours daily, giving practices of how to dodge a ball, how to defend a goal, how and when to pass, improving the stamina of players. During the match competition with the electrical department team Rana motivated confidence of his players and reminded them of their practices Rana too well played during the match and finally won the trophy and being awarded as the best captain. 25 comments to ''How to write a PPDT story on Some players playing in Playground"
Ravi is a captain of the school football team.his coach gave him responsibility for the upcoming foot ball matches.Ravi along with his team mates practices daily evening 2 hour,giving practice s of how to goal,position n how and when pass the ball to each other etc.on 2 dec is a football match they play the match with there effort and finally they won the match and got the trophy. Harsh is captain of their college football team and represting mechanical department in the football championship which is going to be held in forthcoming week.he is training the team mates about various play tactics that how to drive the ball in much effective manner and how to defend etc.The time came and harsh played a very heroic role by making three goals in a row.Their team won the tournament.thus his hard work and determination nd target oriented dtrategies made him reach the deatination.He was awarded by university chancller along with the team. Arun was born and brought in a small village.His younger generations was inspired with his unique ideas and creativity.One day when he was walkin along with his friends he noticed a primary school and found that the small innocent kids were sitting under a tree and learning their classes.He wanted to develop the infrasture of the school building.Henceforth he arranged for a football tournament.Players from all around the city enrolled for the tournament and showcased their real skills and talents in football.Winners were awarded with the suitable trophy.He could able to arrange adequate sum of money from the enrollment fees.Finally he was able to develop the infrastructure of the school building and he saw the smiles on the innocent souls which was inexpensive .He was highly praised by their villagers for his innovative ideas. vickey is football player in his college team. He played football well but he donot have confident on him, so that he cannot played well in his college match. one day his coach force him to take captain role of college team for movitvate him. Vickey analyse himself, what is the mistake? and realize him, After that he performed well in that match and cooridinate the team members and motivate them to play and excecute the technique perfectly. His college team wins that match and he got best player award and he was captain of his college team afterward. akash was a meritorious and sports loving student . he loved playing football and was a active participant. his active role was observed by the sports teacher and so he was made the football team captain for the upcoming event. he took the responsibility and started training with his teammates . he along with the vice captain scheduled the training hours like 2hrs in morning and 2hrs in evening focussing more on defence. they practiced how to dodge a ball , when and when not pass , improved stamina by running all around the ground , made there own tactics and worked hard on it. akash monitored his team members and gave equal oppurtunity to each . on match day the team played tactfully and left no stone unturned in winning the match . his school won the match and akash was happy with the team effort and thanked his teacher for giving him this oppurtunity. Askhay was the football team captain representing mechanical dept. he has good skill in football.The team hasn't scored enough to win the opponents.The team has be caught with a penalty shot for which Akshay comes to take that shot and makes a goal and helps the team to win the match. DEVID WAS STUDENT OF CHRISTIAN COLLEGE ALLAHABAD, AS WELL KNOWS FOR BEST PLAYER OF FOOTBALL LAST YEAR. ALONG WITH HIS TEAM AGAIN WANTED TO WRITE A PAGE IN COLLEGE HISTORY WITH THIS DREAM THEY WORK HARD ON BEST SKILL OF GAME, HE MAT WITH COACH TO KNOW THE OPPOSITE TIME EXPIRIENCE AND PERFORMANCE. FINALLY THE DAY COME THEY ALL BECAME READY TO PLAY WITH THE NEIGHBOUR COLLEGE TEAM AND IT WAS BRILIENT MATCH BETWEEN TEAM DEVID APPRICIATED TO ALL ON THEIR WORK WITH THAT HIS TEAM WON THE MATCH AND GIVEN THE GRETE MESSEGE TO ALL UPCOMING STUDENT. Ram was an school boy living in small town.he was good football player.There was an national game event was going on his school.he was participating in football game.he and his team was playing but opposite team defence is more strong,they did not allow them to shoot goal.during interval ram encourage his team asked for keep full effort and apply clever strategy.During game he came near to opposite wing and jumped from the defence and kick the ball which went inside goal post.hence they won the match with their full effort and team dedication. ajay is a student of class 10.from chilhood he was in love with football.with his parents support and teacher's training he got selected in the school team and recently he is given the responsibility of the captian.they have an upcoming national level competition and he along with his friends practiced day and night and won the cup for the school.his parents and teachers are proud of his efforts and achievements. A football match is being played between two collage iit bombay and iit hyd . one the team is having a vertical strip on their jersey while the other had a horizontal strip in front. all of them are of same age which is around 20 and are giving their best in the field. IIT hyd has won the toss and their formation is 4-3-3-1.till the first half the possession was same but in the 85 minute iit Bombay scored fantastic free kick taking a lead 1-0 and at the same time one of the finest player of iit hyd got injured since only 6 minutes were left and it was very impotant minute for the team so all team members decided rahul to substitute and at the same time rahul told them that he will give hiss 100% effort in the field to win the match later he scored two goal one penalty and the other head shot and finally won the match by 1-2.latter rahul was awarded the man of the match award and also got appreciated by his teammates and team staff members. ram is the football captain of his team . during the last match , he was injured when hewas trying to hit the ball and make a goal. but he didnot lose hope and keep practicing . he practiced a lot on the same move that injured him . 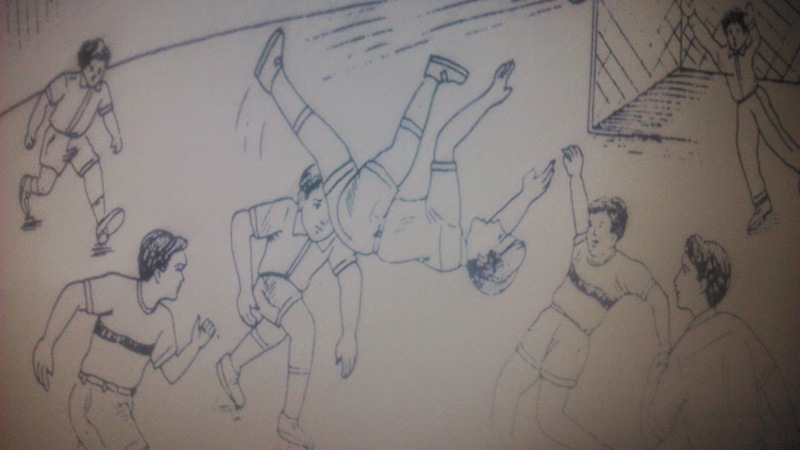 and finally on the next match when his team has to score a goal he made the same move and jumped upside down . he made the goal and his team won the match. sohan was captain of school football team. He wanted to win the football final match which as going to happen next week. He with his teammates worked hard the whole month and improved their technics and stamina. on the final match they were performing well but suddenly fell down and got injured. He took the first aid and again rushed to the match. Even of the injury he secured 2 goals for his team and won the match. sumit was a football player of paramount school. It was 16 May, final match of series was being played between paramount and DPS. Both the teams scored 1-1 goal and 85 minutes had been passed. Caption of paramount team had requested for time break and plan a strategy for final goal in last 5 minutes. He replaced front playing player with Sumit and one more player was placed to help him in strategic manner. Two minutes passed, still there was same postion, Ball in ground exchanging teams. All of sudden Sumit got the ball from his teammates and hit the goal with his head. Paramount team won the match and Sumit final goal was appreciated by all. ravi was 22 year old student who was pursuing his graduation in b.com along with he had great intrest in football so he used to spent his free time in football ground.he had played various tournament where he performed well.one day he got an opportunity to play at national level where he faced various challenges while making a goal, at the same moment he got injured but still he didnt left the ground and stayed at his position and kept motivate to his team members .the time was running out still they need 1 goal to win the match so ravi made a stratergy what he share with other which lead him to made a goal. Wasim is a good team player of football. He really work hard fir the tournament held in his college and from his and his team effort they reach to final match. He really work hard and practice alot for this football tournament because he want to become a footballer. It was a afternoon and match starts and both teams are very strong and match was going so tight and tough with 2-2 goals. In the last 5 mins Aslam and his team player wasim took football and giving everyone dodge reach near to keeper and than Wasim pass football to aslam and he made a very good shoot which results a goal and his team won the tournament . His all the team was very happy to winning the tournament. Pardeep is the captain of his college football team and is representing his college in Inter college sports tournament. They practiced a lot in improving their offensive skills and team work and have entered into the finals against last year champions. They played well in first half match and managed to level the score. In the last few seconds of final half, with the help of a good pass, Pardeep scored a winning goal by doing a reverse flip and they've won the tournament. School physical trainer informed that there will be football selection for school team. today evening. the students are not ready with their boots and jersy. but due to their passion they assembled on the ground. trainer divided the team into two teamA and teamB consist of 7 players each. Teams start play each other. Till 89 mins there were no goal scored by each team bt in the final min team A player raghav scores their winning goal and he played an excellent game throughout the match. He is appreciated by the trainer and mates.he selected for under16 football team. HI DEEPAK TOMAR ... I NEED YOUR HELP... CAN YOUR GIVE YOUR MOBLIE NUMBER.. PLEASE..... MY NAME IS SAI. MY MOBLIE NUMBER IS 9885280105.